Twitter Moves Up The Twitpocalypse. All Hell May Break Loose Today. Twitter users, the Twitpocalypse is upon us. 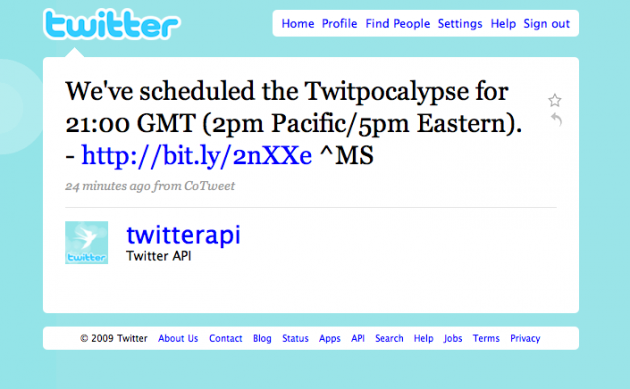 Twitpocalypse is the name given to a bug that’s about to be exposed. Apparently, it’s similar to the Y2K bug in its nature, and stems from the fact that every tweet sent out has a unique numeric identifier. This identifier is about to hit 2,147,483,647. This number is the signed integer limit and apparently when some third-party Twitter clients start hitting it, the identifiers will start turning negative, and those apps are likely to crash as a result. This crash was supposed to happen sometime tomorrow, according to the countdown, but it looks like Twitter has just moved up the Twitpocalypse time to 21:00 GMT, which is 2 PM Pacific/5PM Eastern time today. Yes, in a couple hours. They’re forcing the failure now so that all hands are on deck working on the issue, rather than having it go down in the middle of the night. The overflow of the 32-bit signed integer value for status ids (a.k.a “The Twitpocalypse” ) is fast approaching. The current estimate is around tomorrow at around 11am GMT, or 3:00am Pacific time in the case of Twitter. There is some discussion internally about accelerating things so we’ll be in the office and able to cope. Nobody is their freshest at 3:00am, not to mention it would be nice to not have apps broken throughout the weekend if one-person developer teams don’t notice. No decision has been made yet but I wanted to get something out to you all so you know what’s going on in the event we decide to do this. The responses to @twitterapi and all discussions internally show a preference to not waiting until the middle of the night. The current plan is to force this issue at 21:00 GMT (2:00pm Pacific/5:00pm Eastern for those in the US). This will let us make sure we have all staff available in the unlikely event something goes wrong on our end. We’ll also be available when people who don’t follow the twitter-dev-talk list start reporting errors. While we did warn developers about the Twitpocalypse I’m sorry we didn’t think about setting a drop-dead date and scheduling this previously. We’ll keep trying to improve on warnings like this. Good night, and good luck. So yeah, be prepared for some Twitter apps to fail in about 2 hours. Hopefully Twitter will be able to resolve this quickly. Update: It’s possibly a coincidence, but Twitter has just welcomed two new members to its API team today. Is Twitter manning up for the battle? Update 2: It’s now past 2 PM and no reports of massive failures yet. Perhaps this really is just like Y2K. Just an update, there is a lot of coordination that it takes to pull something like this off. We need the operations team to watch the servers and application. The services team to work closely with the ops folks to ensure that any problems on our end are properly tracked and fixed. And Matt is running around coordinating the entire effort. That said, the deadline may slip a bit as we work to ensure that we’ve covered our bases, and that the engineering team is ready to react to unforeseen problems. Doing what we can to keep the tweets flowing. Update 4: The crisis looks mostly averted. More here.